Fit Fluential Mom: Dinnes is Served! 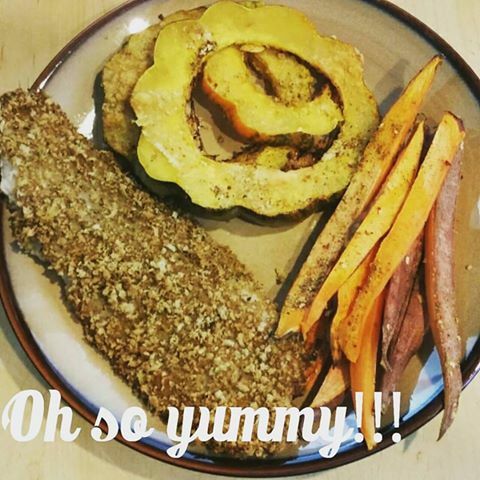 Panko Crusted Tilapia, Sweet Potato Fries & Acorn Squash! Dinnes is Served! Panko Crusted Tilapia, Sweet Potato Fries & Acorn Squash! One of mine and my family's favorite meals. Easy to make, very little prep and cooks while you help kids with homework, clean up the house or just RELAX! :) The recipe I made serves a family of 4 so adjust accordingly or make extra to have on hand for lunch the next day! 4 tilapia, swai or other fish fillets. Any type will work so choose your fave! Marinate fish it in balsamic vinegar, lemon juice and seasoning and, if you can, leave in the refrigerator marinating. I leave it overnight but you don't have to. Pour panko breadcrumbs into a shallow dish. Cover both sides of the fish and place each piece on a rack sprayed with olive oil spray or non stick baking spray to prevent it from sticking. Slice up sweet potato fries to your desired thickness. The thicker they are, the longer they take to cook so I cut them as thin as possible. Try to picture a regular french fry and I go for that thickness. That way everything cooks in the same amount of time. 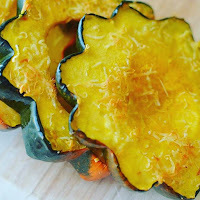 Spray them or LIGHTLY drizzle with olive oil, toss in seasoning and place on a pan or rack. Slice up acorn squash into ½ inch thick slices, remove the seeds inside and place on a non stick baking sheet. Spray lightly with olive oil spray or brush it on lightly, sprinkle some no salt seasoning & some parmesan if you'd like. Place the fish, squash and sweet potatoes into the oven and bake for about 20 minutes. The potatoes take the longest so check everything before you remove it. It should all be ready within 20-35 minutes. While it's baking, make your salad. Chop up your romaine lettuce, tomato and olives. Toss in a bowl and sprinkle with feta cheese (a little goes a long way!) Toss in balsamic vinegar with a sprinkle of lemon juice and serve.